Know what’s even better than that? There’s no evidence that you had some pie. Use a napkin, and you can just toss it away when you’re done, rather than having dishes to do. That’s a pro tip! Thanks to Chicago Metallic for sponsoring this post. Links may be affiliate links. 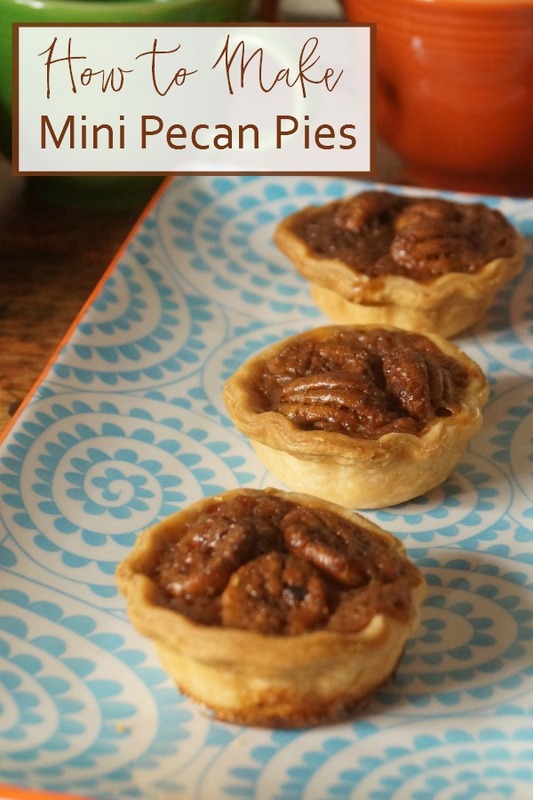 Although these mini pecan pies look like a lot of steps, they are very easy. You should be able to finish them in a little over an hour, including baking. 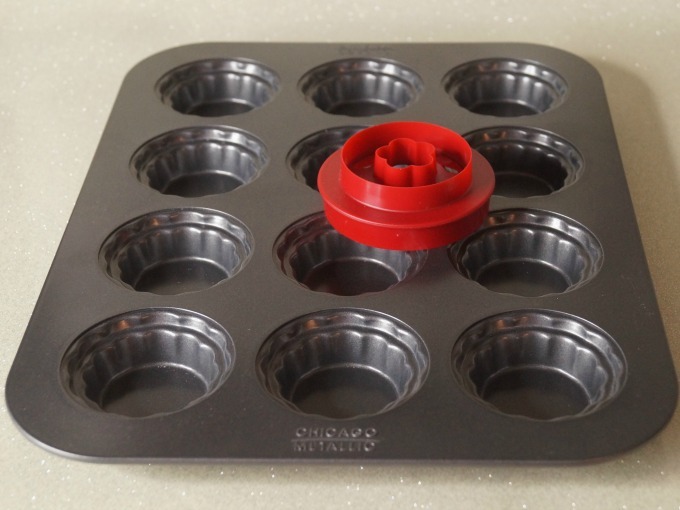 To make this even easier, we used the mini pie pan from Chicago Metallic. It comes with a dough cutter, so you always have the perfect sized pie crusts to use. It’s so easy to use! We used eliott pecans from Pearson Farm in this recipe. They’re flavorful and plump. Preheat oven to 350 degrees. Remove pie crusts from the fridge and let them warm to room temperature to soften slightly. Do no put in the microwave to warm crust. Open the first crust, and gently unroll it onto a piece of parchment paper approximately 12 x 12 inches. This will keep it from sticking to the counter. Try to keep from tearing the crust, but if it does tear, dip your finger in water and gently press the torn edges back together. Smooth your pie crust circle out so it is flat, and the thickness is even. Starting at the outer edge, use the cutter to cut your tartlet crusts. Be careful to not overlap your cuts, but place them close together. You should be able to get about 8 tartlets from each round. Save the scraps. In a medium bowl, melt the butter. Add the sugars, salt, vanilla and corn syrup and mix well. Break the eggs in a separate bowl and beat to mix together. Stir eggs into butter-sugar mixture. Place one crust into each tartlet in the pan. Gently press the circle into the pan, and push the crust against the bottom and side of the tartlet. You don’t need to worry about crimping the top edge. TIP – I sprayed the pan with non-stick cooking spray, just in case. Repeat with the second pie crust. Re-roll the scraps to make additional tartlets. You should be able to get 24 from the two crusts. 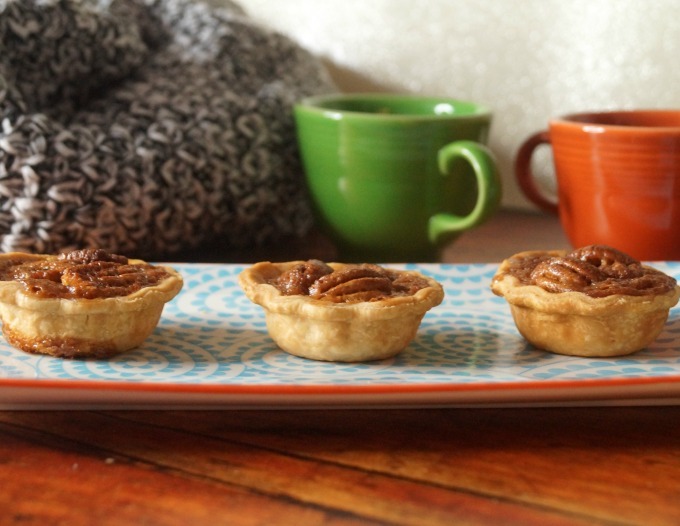 Place 3 pecan halves in each tartlet. Don’t worry about perfect placement, they will float to the top and make a nice design. Using a large spoon, fill each tartlet with the sugar-egg mixture, leaving about ¼ inch at the top unfilled. Repeat for all crusts in the pan. Also, don’t worry if the pecans float or get wonky. They will correct themselves during the baking process. Before baking, clean any spills on the pan with a small paper towel. 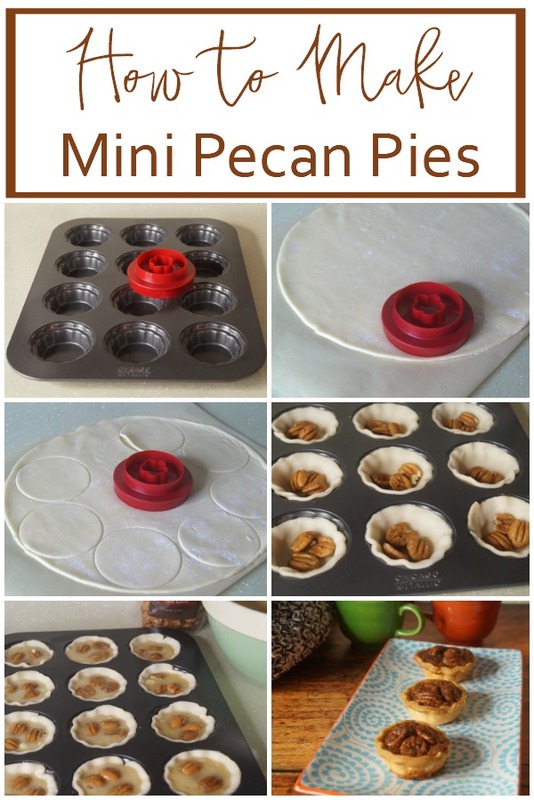 These spills will act like glue, and your mini pecan pies will be difficult to remove from the pan. Bake at 350 degrees for about 15 to 20 minutes. Check after 15 minutes; they should be set (not liquid or jiggly) and nicely browned. Remove from the oven to cool. Let cool about 15 minutes in the pan; loosen the tartlets with a knife, if necessary. Remove from the pan. Clean any remaining bits of filling or crusts from pan with a damp paper towel. Repeat steps 5 through 10 for a second tray of pecan tartlets. 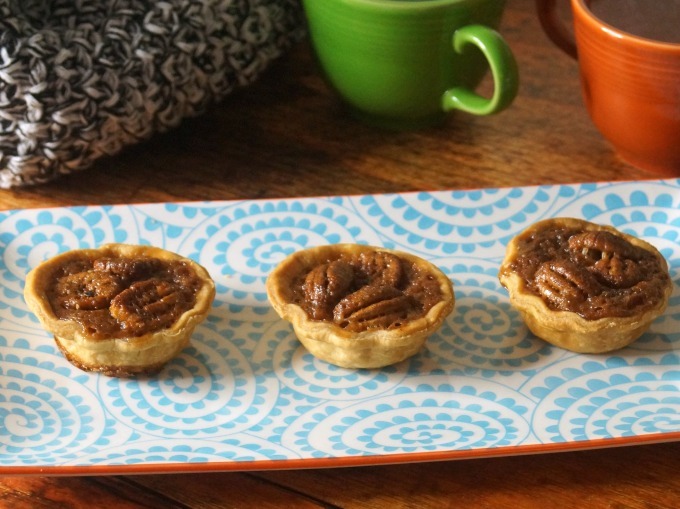 These mini pecan pies will keep for 2-3 days at room temperature, or they may be refrigerated or frozen for longer storage. Get the fantastic serving tray here. Great pecans are available here. WHAT a novel idea! These are perfect little sweet appetizers!